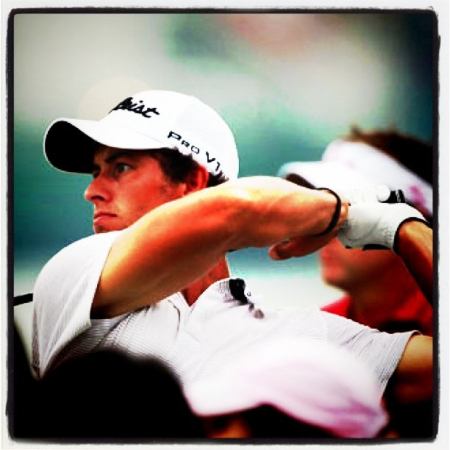 The pair will be chase a €376,860 top prize in next week’s Dunlop Phoenix tournament at Phoenix Country Club with Lowry bidding to improve on his seventh place finish there on his Japan Golf Tour debut in 2009. The 54-hole Singapore Open will spill over into Monday after lightning forced organisers to postpone a play-off for the title between Spain’s Gonzalo Fernandez Castaño and Juvic Pangusan of the Phillippines as they prepared to play their third shots to the 18th from around 100 yards at the first extra hole. Castaño, who is chasing his first win since the 2008 British Masters, was happy just to par the last three holes and scrape a play-off after struggling with his game on the final day. “It was a tough day out there – one of the toughest I have ever had,” said the Spaniard, who had a three-shot overnight lead. “The heat was brutal and my game was not good. “I was feeling the pressure because it has been a long time without a victory and I want this one desperately. I felt the pressure at the end. My game was just not there, the putter wasn’t working and I made it tough for myself but at the very end to make that par on the last made my day. The Spaniard found water off the tee at the last but holed a curling 20 footer for par to earn a play-off after carding a one over 72. 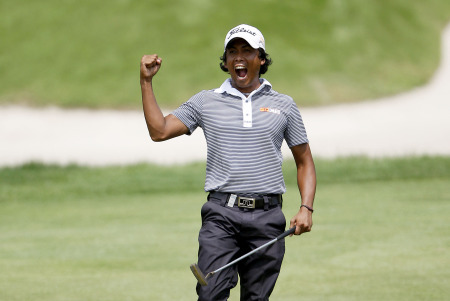 Juvic Pagunsan celebrates his birdie at the 18th. Picture courtesy of Barclays.Pangunsan felt the title was his when he saw Castaño drive into water and he birdied the last from eight feet for a 67 to set the 14 under par target. In the play-off, Pagunsan went first and found the fairway but Castaño could not follow suit, finding sand. After an hour or so delay for lightning, the players emerged and both laid up on the fairway, but as Pagunsan was weighing up his third shot into the par 5, play was called again as a loud peal of thunder was heard overhead. “Well we have done pretty well today to get through the third round and get it completed,” Tournament Director Stewart said. “Unfortunately we started the play off and both players hit one shot, a storm came in on top of us and that led to suspension of play and sitting around waiting for the weather to improve. “We had a small window of opportunity which we tried to take. We got the players out and they hit one more shot. We had to bring them in again. “It was dangerous out there. There was lightning flying around. We had to get everyone inside as quickly as possible. “Any little window of opportunity would have been important to achieving our objective of concluding the event. We were sitting around for a couple of hours but in the end it became pretty untenable. The pair will effectively be playing pitch and putt for a $1m top prize though by the time they actually finish, McDowell and Lowry will be in the Land of the Rising Sun. Ulsterman McDowell closed with a five under par 66 to finish tied 13th on eight under par with the likes of Lowry, who carded a three under par 68. 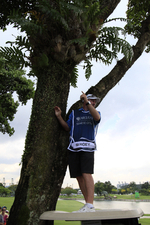 Michael Hoey uses binoculars to try and identify his ball up a tree at the 18th. Picture by golffile.ieMichael Hoey endured a disappointing final day as he lost a ball up a tree at the last and took a double bogey seven, signing for a 74 that relegated him from fifth overnight to tied 23rd on six under. Peter Lawrie was four under for the tournament with just seven holes to play before taking a quadruple bogey eight at the third, his 12th, en route to a 76. Michael Hoey’s caddie, Eoin Craig, uses a buggy to try and find his boss’s ball on the 18th.Click to enlarge. 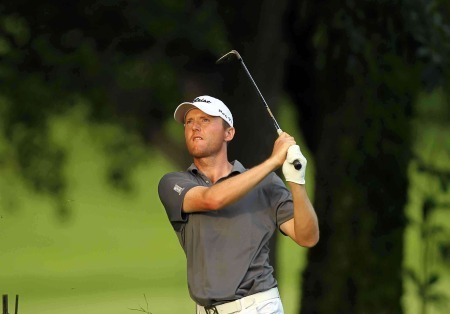 Picture by Eoin Clarke/www.golffile.ieThe Dubliner ended up tied for 75th on one over while rookie Paul Cutler, who made the cut on the mark after completing a tremendous 64 on the shorter Tanjong Course on Saturday morning, ended up tied for last on four over after a closing 78. Cutler, who earned his first cheque as a professional in Singapore, will have another chance to climb the money list when he appears on a sponsor’s invitation in next week’s Alfred Dunhill Championship at Leopard Creek in South Africa. The event is one of two co-sanctioned European Tour events taking place. Seven Irishmen will tee it up in the Iskandar Johor Open across the border from Singapore in Malaysia with Padraig Harrington, who missed the cut by seven shots this week, defending the title in what has since become a co-sanctioned event with the European Tour. Harrington will be joined at Horizon Hills Golf and Country Club by Hoey and Lawrie while Asian Tour member Niall Turner, Paul McGinley and card strugglers Damien McGrane and Gareth Maybin will be hoping for better after missing the cut in Singapore. Harrington needs a big week with only the Hong Kong Open remaining for him to make the Top-60 who will qualify for December’s Dubai World Championship. Maybin, who was sitting in the hot-seat at 115th in the Race to Dubai starting the week, looks certain to fall outside the top 115 when the money list is updated following Monday’s play-off in Singapore. As a result, he will travel from Johor for the South African Open at Serengeti Golf Club in a bid to ensure his place in the top 115 who keep their cards. He will then head from South Africa to Hong Kong for the final regular event of the season, the UBS Hong Open in Fanling. Gonzalo Fernandez-Castaño won the title with a birdie at the second play-off hole. It was his fifth European Tour win and his first since the 2008 British Masters. His last four wins have all come in play-offs. Play-off resumed at 7.30am local time. And what a start from Pagunsan as he hits a wedge to six feet. Fernandez-Castaño follows him in to about seven feet. Fernandez-Castaño putts first and missed it on the left. Pagunsan stepped up to take the title but he too missed left. Fernandez-Castaño safely tidied up and it’s back to the 18th tee. Graeme McDowell gave his Race to Dubai chances a massive lift when he blasted five birdies in an amazing six hole stretch before play was suspended in the Barclays Singapore Open. Graeme McDowell’s hopes of putting another big dent in Martin Kaymer’s Race to Dubai lead suffered a blow when he slipped five shots behind Adam Scott in the weather-delayed Barclays Singapore Open. Frustrating as it must be for Irish golf fans to watch Padraig Harrington head for his seventh missed cut of the season, Michael Hoey and Shane Lowry gave them plenty to cheer in the second round of the weather-delayed Barclays Singapore Open. 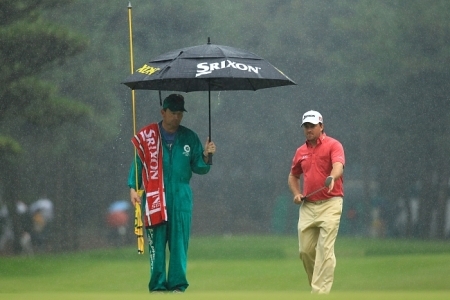 Graeme McDowell suffered in the showers as he signed for a soggy 71. Shane Lowry might be just four shots off the lead but Graeme McDowell still believes he can mount a weekend charge and come from eight back in the Dunlop Phoenix Tournament in Japan.